Here is a photo from our hotel room balcony, lovely Armacao de Pera, in the Algarve of Portugal. The weather is warm and sunny, in the 60s and 70s F, with a nice breeze. Birds are singing in the tree tops. The roar of the waves on the yellow sand beach is muted by the distance but constant. The sandstone cliffs are filled with fossil shells. Slowly the ocean works into the cliffs, crumbling them back into sand. In some places grottos and sea stacks form, interesting for photography and exploration. I’m in England, visiting my mum. She lives in Kent, the southern part of England where the temperatures are quite moderate and they hardly ever get frost or snow. 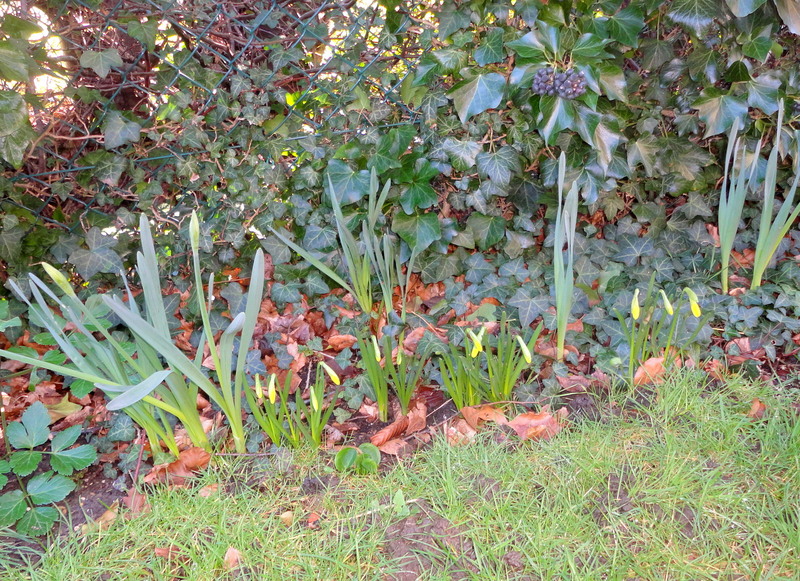 See how the daffodils are up and almost ready to bloom on Feb. 21! 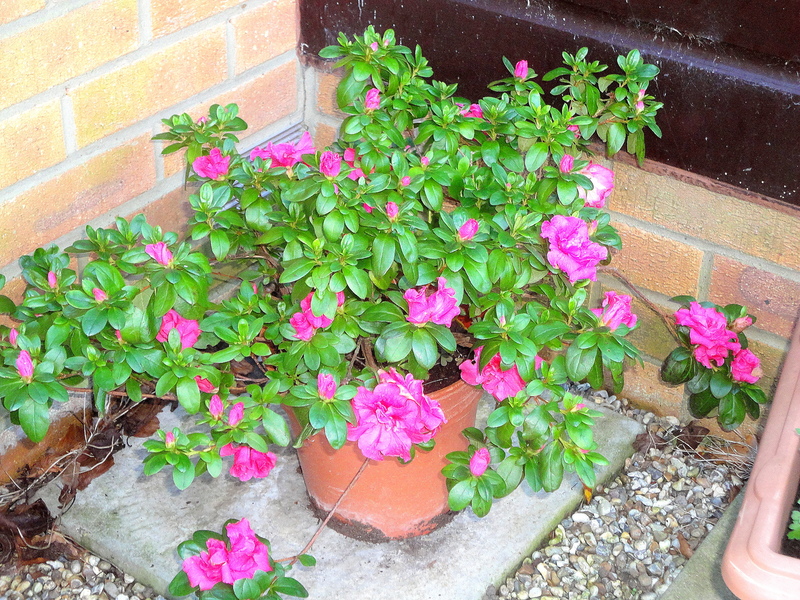 Her azalea plant is in full bloom, very pretty. 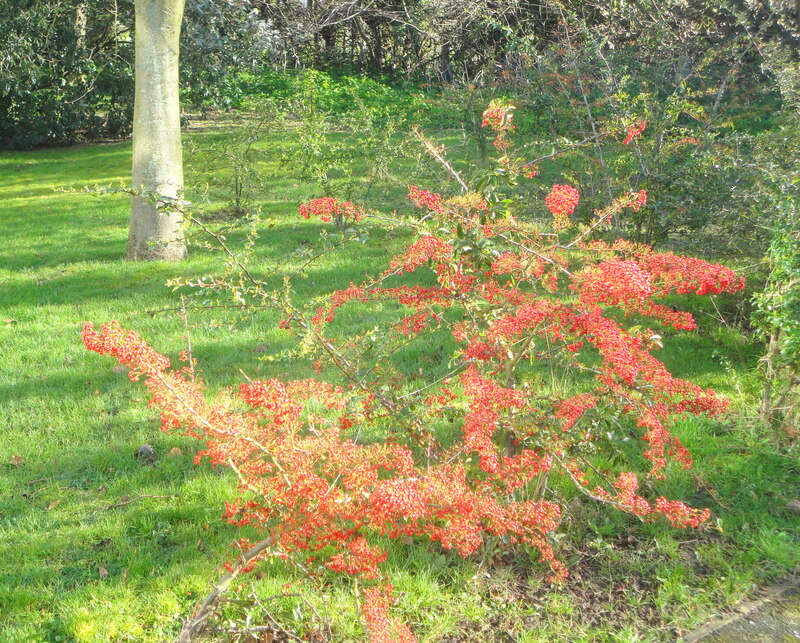 The lawns are green, and some trees, mostly what look like cherries, are blooming. Also the gorse is flowering, a pretty yellow bush. There are lots of birds singing and the sun is bright with temps getting into the fifties today. A lovely break from three feet of snow and temps in the teens in Maine. 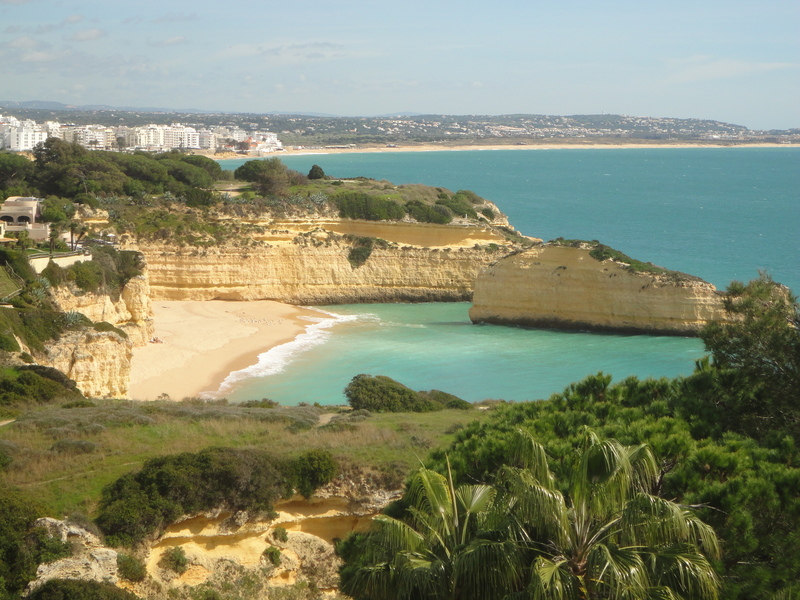 After a few days in the UK, Mum and I are flying down to Portugal, to the Algarve, the beautiful southern coast. I hope to have some excellent shots of Portugal to blog about soon. Here is the back lawn at my mum’s in Kent, with a small pyracantha bush covered in bunches of tiny berries the birds love. I still am not accustomed to all the green after months of ice and snow. Poor England has not escaped the ravages of winter. Their suffering has come in the form of endless rain. The flooding is evident in farm fields and I even saw a soccer field under water. I am very fortunate to have the sun today! 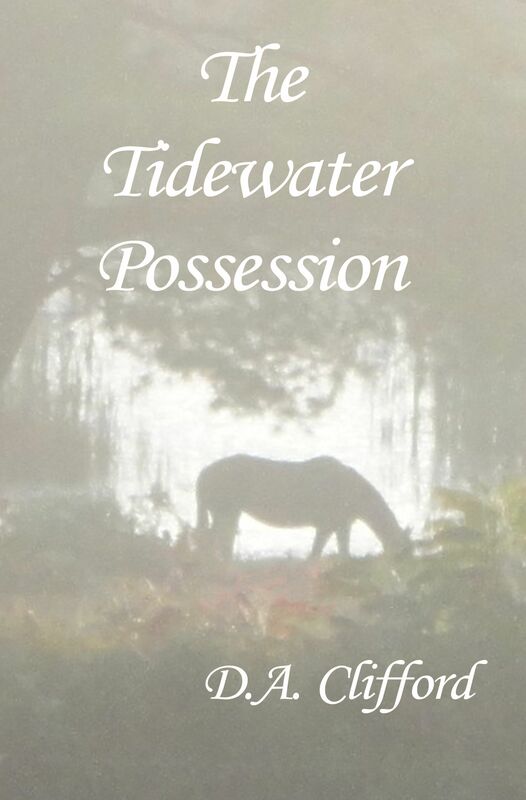 The Tidewater Possession is now available as an ebook for the Nook reader by Barnes and Noble. Also on Amazon for Kindle and in trade paperback form at Amazon or CreateSpace. Coming soon to the Kobo ereader, too! This entry was posted on February 16, 2014, in Books, Uncategorized and tagged demon, ebook, fiction book, ghost, kindle book, Nook book, paranormal, psychic, self-published book, slavery, southern plantation life, supernatural, The Tidewater Possession. Meet my new bird of paradise plant. It has no name. Just a baby, the plant is about one foot tall. I bought it through Amazon and it arrived well packed and very healthy. This is the second bird of paradise I’ve had. 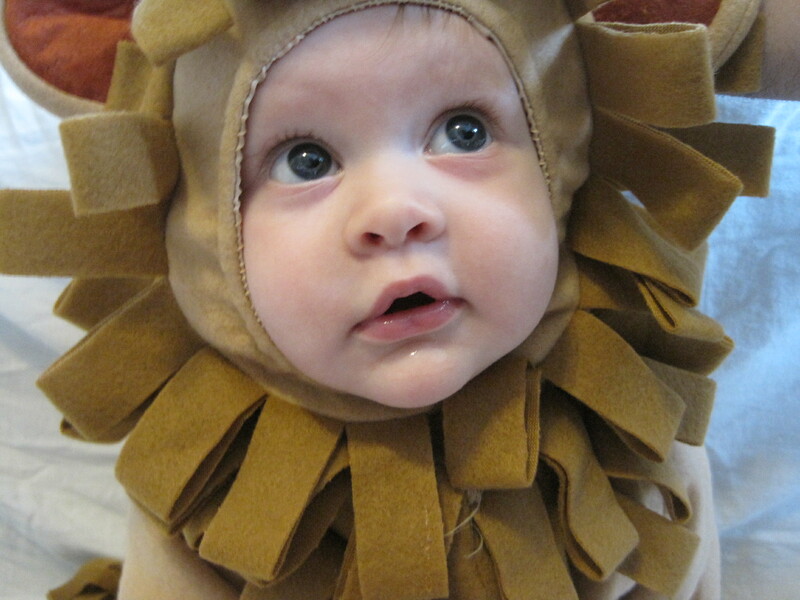 The first also came to my doorstep as a baby. It grew to a full sized plant, over six feet tall. After twelve to fifteen years of living with this gigantic house plant, I decided it was time for it to go to a more suitable environment. I sold it to a man with a large atrium where it would have room to stretch out. My new baby is a dwarf plant and won’t grow taller than two to three feet. Phew! 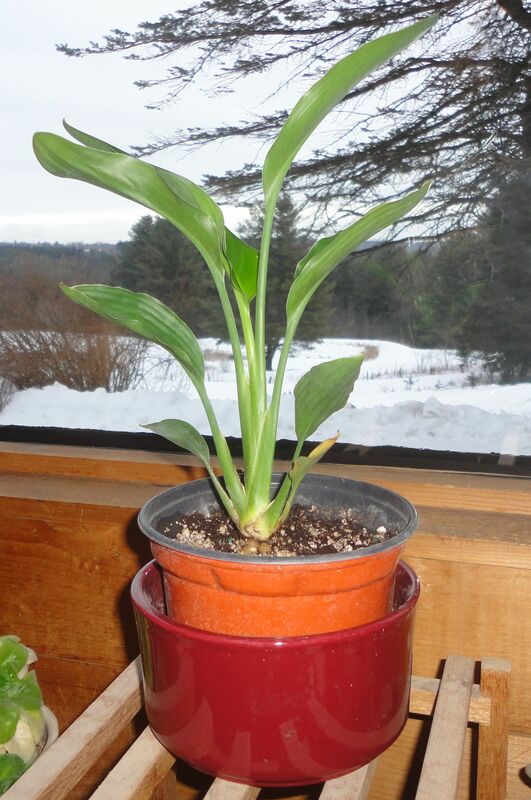 Bird of paradise plants grow slowly, especially in the contained surroundings of the house. Just sprouting a seed can take years. Once the seed starts, a rhizome grows and leaves develop. These plants are related to the banana and the leaves have a similar look. When leaves begin to grow, each successive one is a bit taller and broader than the last. When the plant gets to be four to six years old, it may bloom. My baby is the common orange or red variety. 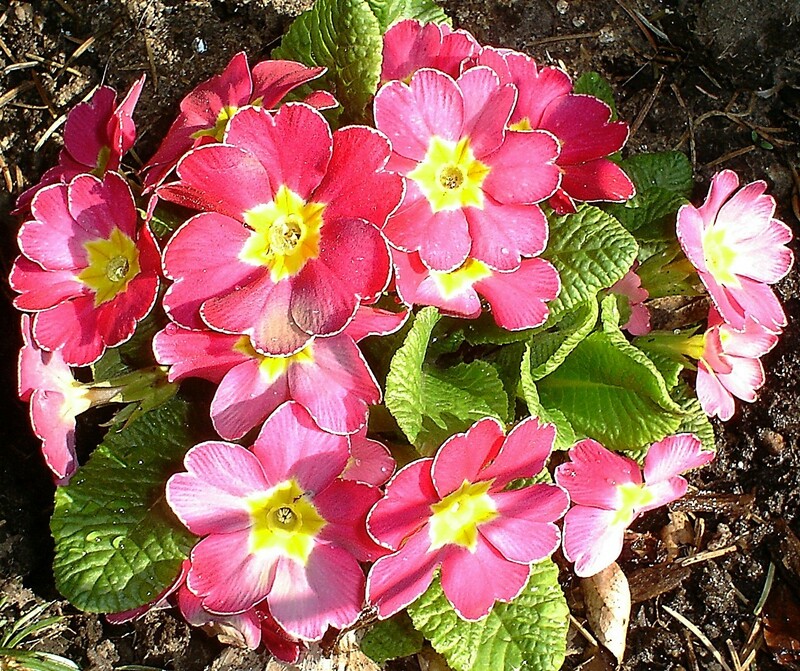 The flowers will look like this, an example growing outside in Spain. Bird of paradise bloom in the late summer if there is enough light, food, water and humidity. I found the plant to be fairly easy to grow and my large one bloomed every year with multiple flower stalks. You can tell the flowers as they emerge from the base of the plant. The newly growing leaves look like rolled scrolls and flowers have a snake-head appearance. The stalk grows to the same height as the leaves, forms the bird-head then pops up one flower after another until the flower head is fully open. 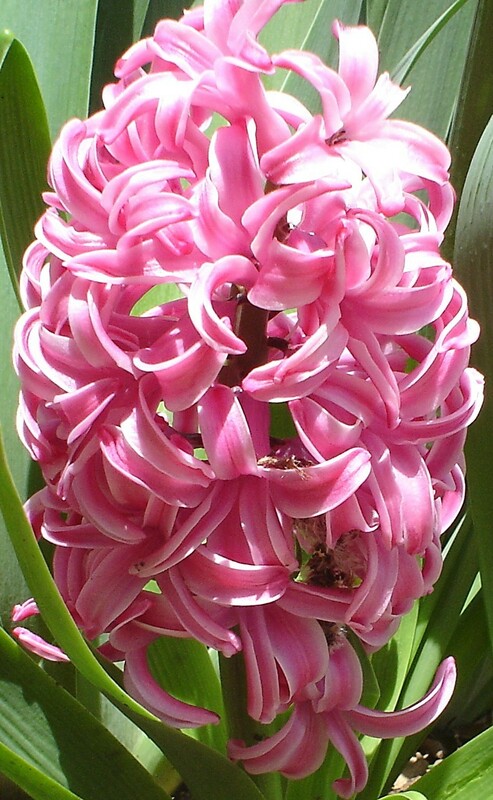 The flower will sometimes drip a small amount of sticky, clear sap as a new set of petals emerges. Bird of paradise plants require big containers. They have huge root systems like tangled snakes, some close to an inch in diameter. The roots coil around the pot and push, expanding until the pot breaks. 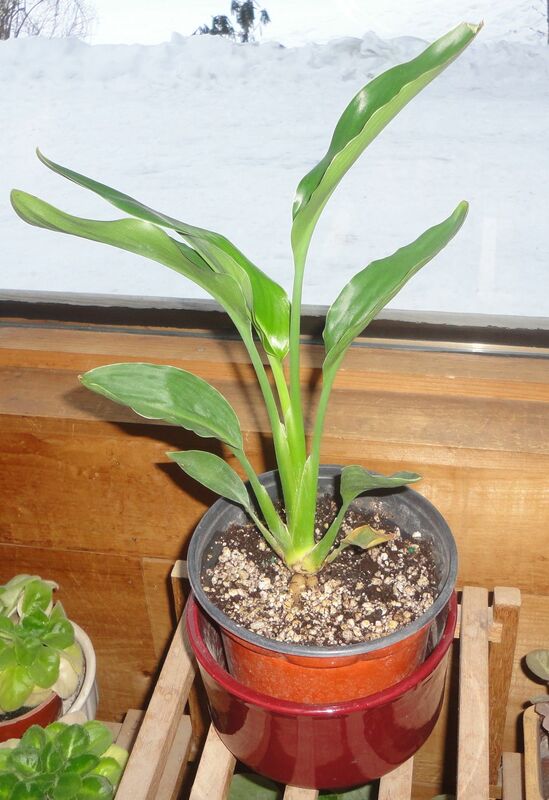 Root pruning is necessary and occasional dividing of the plant to keep it within houseplant bounds. 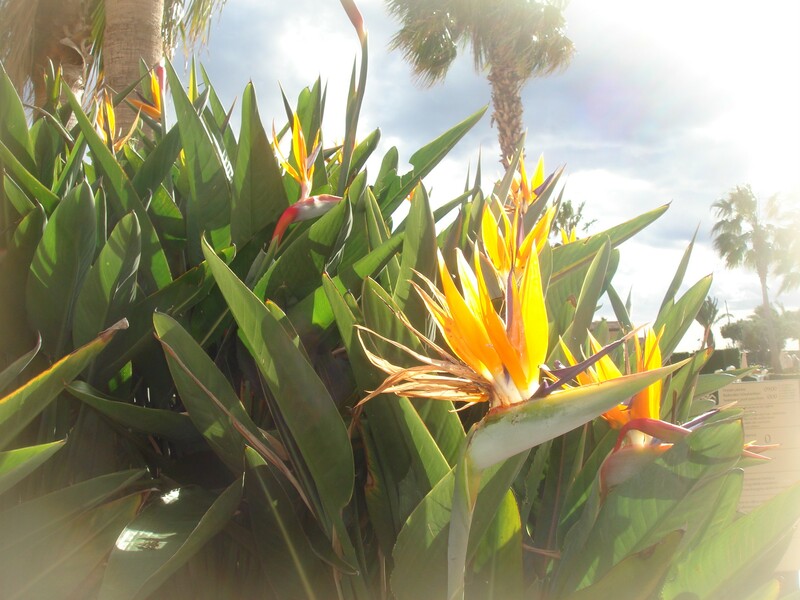 Outdoors, bird of paradise will colonize a large area over time, just like irises. I fed my old plant with regular houseplant fertilizer, watered every week, used a mulch of a carpet-forming plant around the base and misted the leaves with water to keep them dusted. The plant did well in an east window where there was plenty of light. Our house can get chilly at night in winter, down into the fifties, but the plant never minded. When the flowers are done, or the leaves turn yellow, cut back to the base just above the wide area where the stalk emerges to remove the old growth. I look forward to seeing my new baby bloom. The wait is worth it. Once the plant becomes established, it is like a member of the household, its big leaves and beautiful flowers demanding attention. Right now the tiny plant is adorable, like any other baby, because I know just how huge it will become one day. The tropical feel of the plant helps to ward off cabin fever when the snow is deep outside and the wind keens around the house corners. I look at the plant and imagine a white sand beach, the hiss of surf and a gentle breeze from the south. Helps to forget winter for just a few moments. 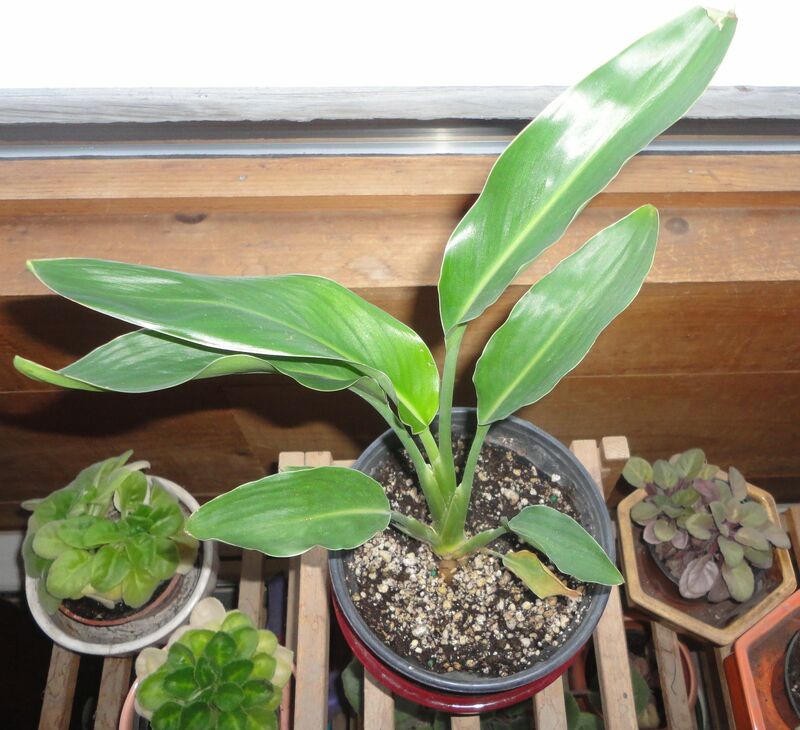 This entry was posted on February 13, 2014, in Cultivated Plants, Uncategorized and tagged bird of paradise plant, growing bird of paradise plants, growing houseplants, tropical plants. 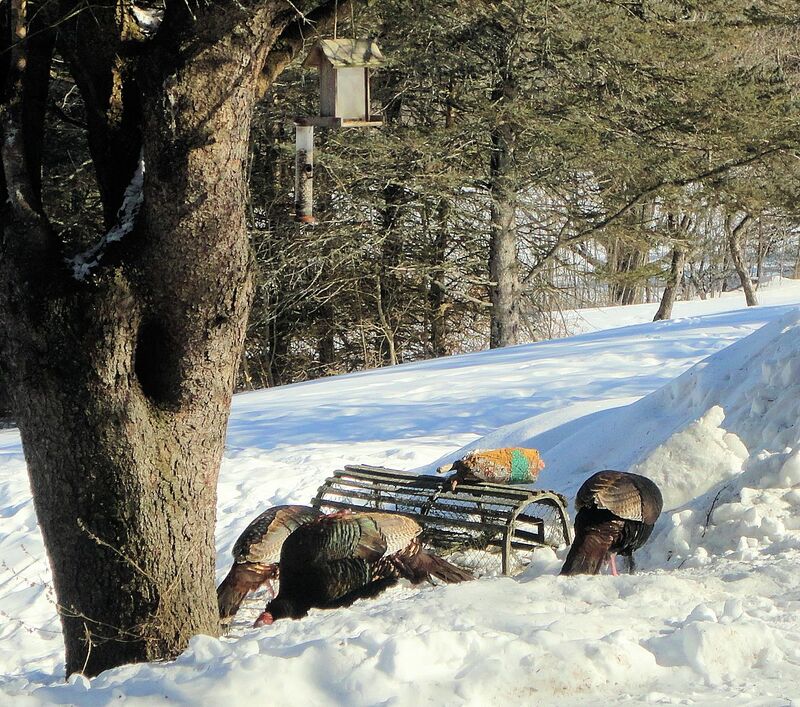 Turkeys scavenging under the apple trees. Wild turkeys roam our land. This was not always so. As a child, I never saw or heard a turkey on the farm. Where turkeys had historically been plentiful, they were extinct by the 1960s when my family moved to the farm. 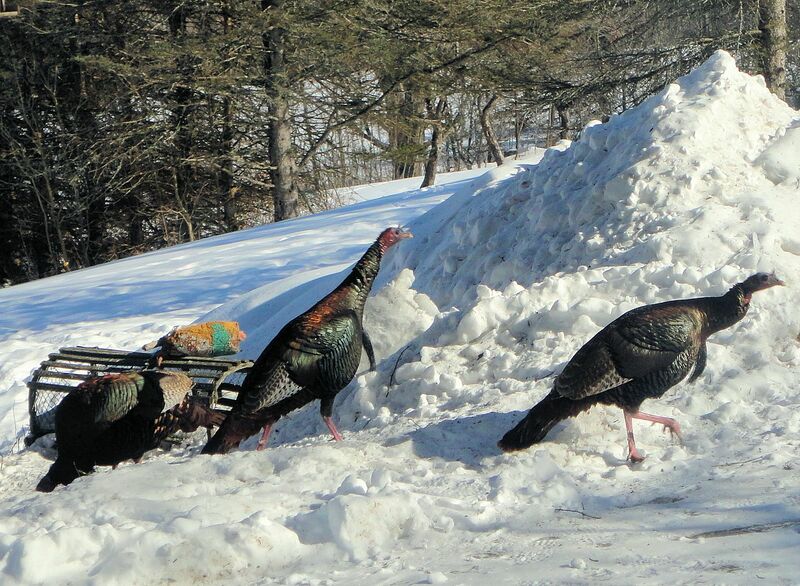 Through the efforts of the State, the wild turkey has been very successfully re-introduced to its Maine range. The large, wary birds are seen often. The toms call in the woods. 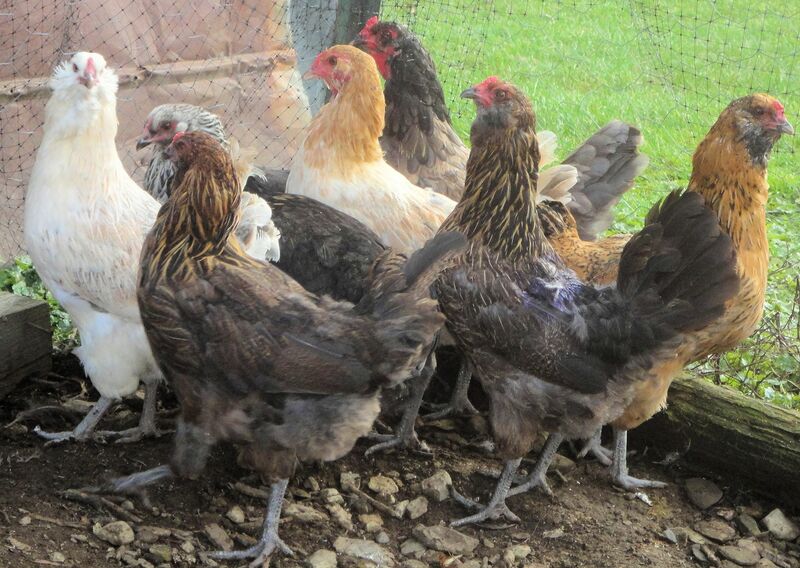 Whole families of hens, toms and poults roam the fields. 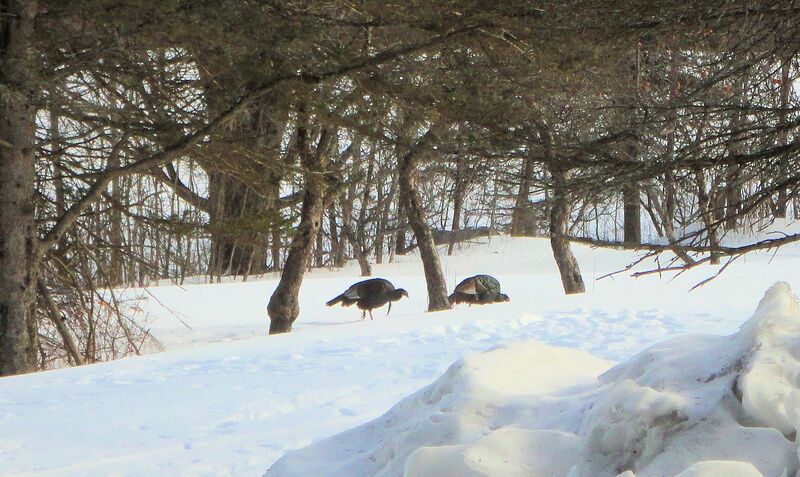 I’ve watched two tom turkeys battle for hours at the bottom of our pasture, until one finally gave up and ran. Then, in a matter of seconds, they were best friends again, eating grass shoots side-by-side. I was able to collect several beautiful feathers that fell from the colorful male birds during the tussle. 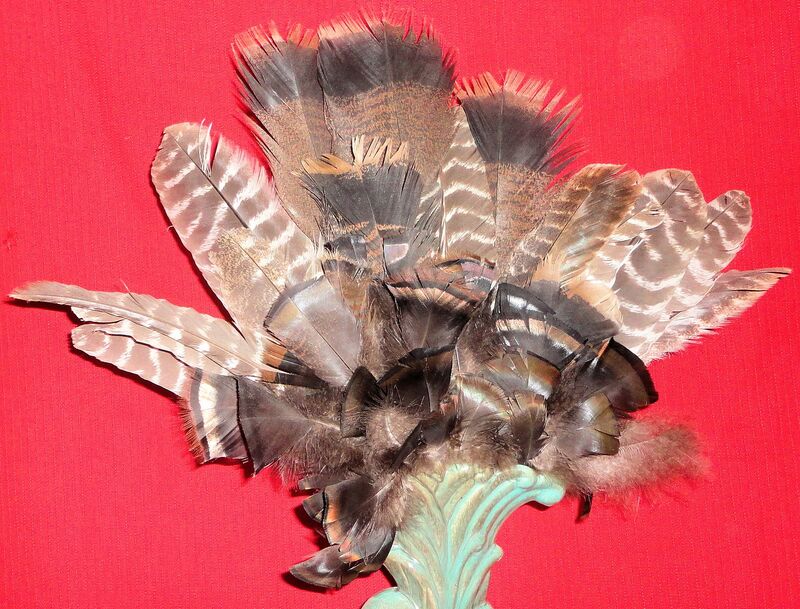 I have a whole vase full of turkey feathers picked up on our land. Most have a gorgeous purple iridescent sheen. The striped ones are flight feathers, the tall two-tone brown are tail feathers, and the other, square-ended plumes are all body feathers. I love to see these wild birds. Their comeback is a major success story, I think, righting a wrong done by our ancestors. Some don’t agree with me, they think the turkeys eat food that would otherwise sustain deer. I say turkeys and deer cohabited here for millenia before whiteman arrived and that is the way it was meant to be. The deer herd is large and healthy. For certain, there are enough apples in our orchard to go around. Turkey and deer prints lace the orchard snow. The recent foot of fresh powder snow makes an excellent canvas for recording wildlife activity. Yesterday I found a spot where three turkeys took flight. The marks are obvious in the snow. The entire wing imprint is evident, the primary and secondary feathers beating against the snow to help push the heavy bird into the air. The furrow left in the snow by the tail and undercarriage of the bird quickly decreases as the body becomes airborne. 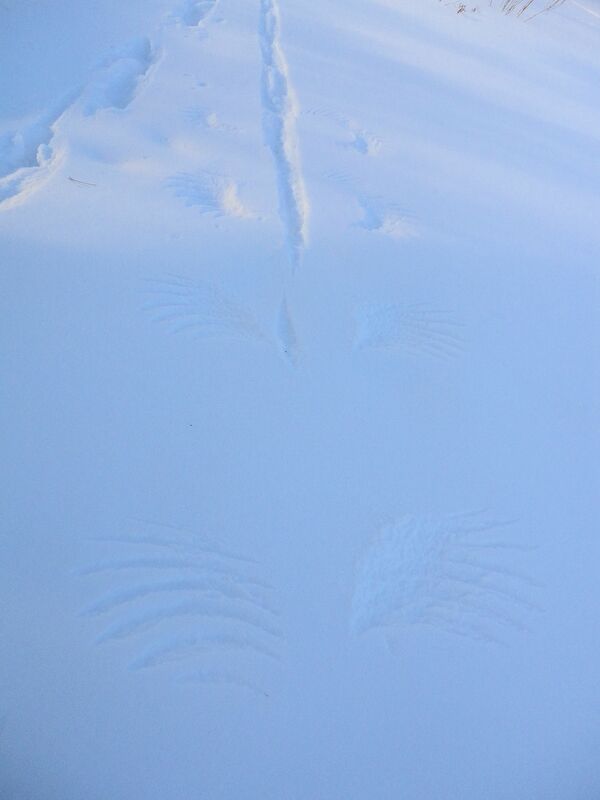 Here is the trace left by one of the turkeys in the snow. Turkey flight path, bird flying directly toward the viewer. 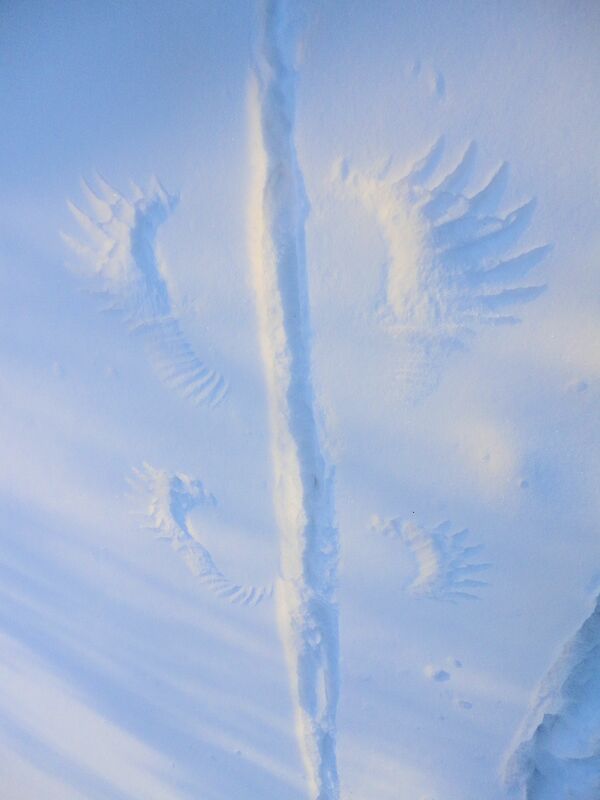 Direction of flight toward the top of the photo, the indents of the individual primary and secondary flight feathers in the snow, and the furrow left by the body. One Thanksgiving Day we were visited by eleven wild turkeys in our front yard. Guess no one told them what was on the menu! I have surprised a group of more than twenty birds in the orchard or the blueberry patch. The sight of so many huge birds taking to the air at once is amazing. I hope we will always enjoy the company of these lovely wild birds. Now if only man could clone and re-introduce the passenger pigeon. I would love to witness the fabled endless clouds of migrating pigeons that our ancestors enjoyed, just before they killed and ate them all. It’s snowing again today, a Nor’easter with 10″-12″ accumulation predicted. Looks like the weather is trying to live up to the forecast, too. The snowfall has been steady all day. A perfect day to process all the pullet eggs I’ve been collecting to make blown eggs. The work is time consuming so it’s best done when there’s nowhere to go and nothing to do but watch snow fall. With a healthy flock of young Ameraucana hens just starting to lay, I’m getting a lot of small but very nicely colored eggs. 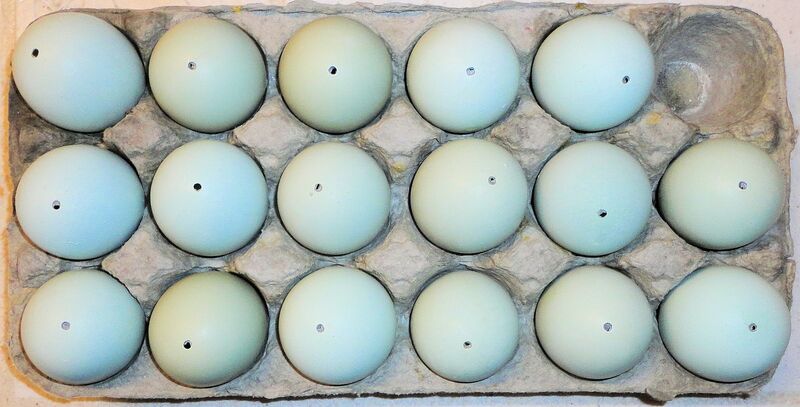 Ameraucana chickens carry a gene that turns their egg shells blue. The first eggs a hen lays are always the deepest colored. My girls lay an assortment of shades, mostly medium pastel turquoises, ranging from green to nearly blue. I have been breeding these birds for many generations to produce the best, darkest blue color I can. We’re getting there. It is a shame to waste the lovely shells, so I save the very best colored eggs that have no laying irregularities like ridges or odd shape. When I get a bunch, I drill a tiny hole in one end and carefully remove the contents of the egg. The process I use is one I developed myself through much trial and error. I prefer not to write about it here, a trade secret. Suffice to say that it takes a long time to clear out the innards and put the eggs through several rinses to get the insides perfectly clean. Then I dry the eggs and offer them for sale in my online stores. The blown eggs sell very quickly and I usually earn about $1 per egg for my efforts. They are most popular around Easter. Some people use them to create pysanky, lovely painted decorative eggs. Nothing from the eggs goes to waste. I save all the innards and have a big bowl of pre-mixed eggs ready to go into baking or to make a batch of scrambled eggs. This latest set of blown eggs started as 18 but one shell burst under the pressure of having the insides blown out. Sometimes an egg will have a weak place that is not visible but shows up when cleaned. Here is a shot of some of the ladies on a nice spring day, when all the snow is forgotten. Ok, she’s not dressed as a groundhog, but close enough. And the picture of Lia has as much to do with Groundhog Day as woodchucks have to do with predicting the weather. Why do such foolish traditions persist in our speed-of-light modern age? The origins of Groundhog Day are buried in the swirling mists of our past. February 2 is Candlemas, a date exactly mid-way between the Winter Solstice and Spring Equinox. Superstitious Europeans believed cloudy weather this day meant an early spring and sunny weather indicated unremitting blasts of wintery weather for at least six more weeks. Should the hedgehog see his shadow on Candlemas, winter would be long. Once Europeans settled in North America, the groundhog was substituted for the hedgehog. Here in Maine, all the woodchucks are in deep hibernation and there is no danger of their peeking from holes for at least six weeks, anyway. The holes are buried under two feet of snow and ice. Today at the farm, it is cloudy and above freezing. A storm came through overnight and left about three inches of wet snow. Will the remainder of winter be mild? Possibly. If the past few decades are any indication, winter ends earlier every year. February and March are often quite mild, with frequent chilly, dry Aprils. 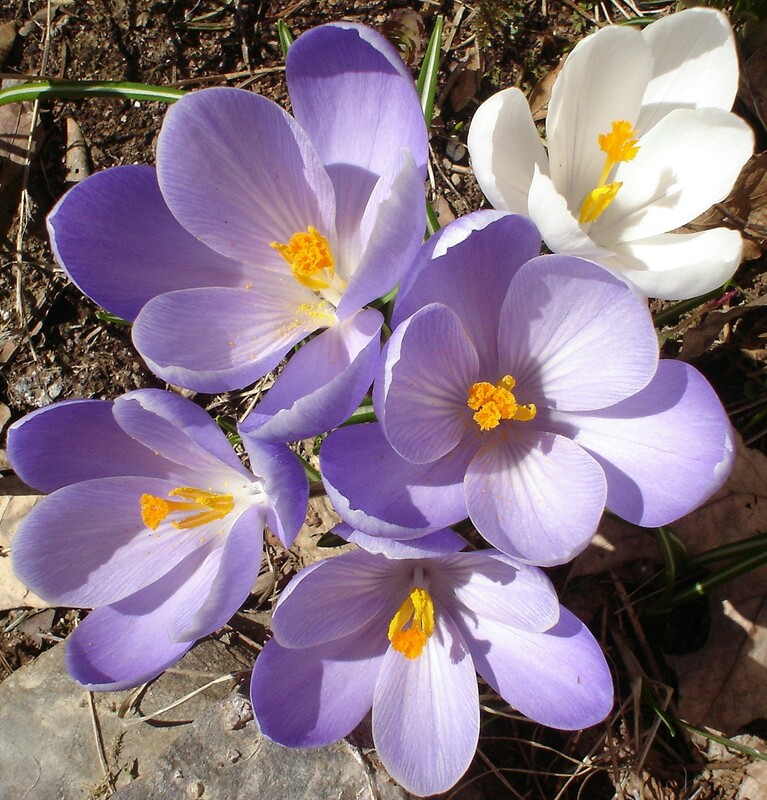 To further influence the weather and encourage early warming, I offer these shots of spring blooms waiting in my garden beneath the snow. Happy Groundhog Day!